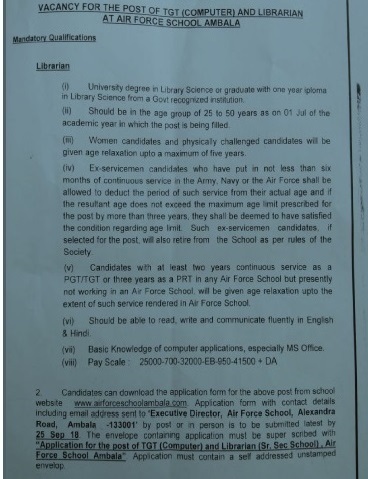 Air Force School, Ambala invites Application for the post of Headmistress, PGT, TGT and Primary Teachers jobs on permanent basis. 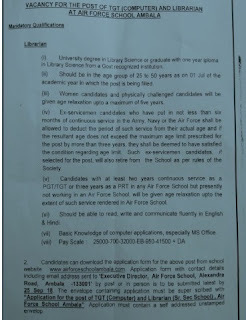 Apply for these posts at Air Force School Ambala Recruitment on or before 14/07/2014 & 18/07/2014. The candidate should be Graduate Degree with an aggregate of 50% percent from any University recognised by the Govt of India/UGC/AICTE. At least 01 year as Principal / HM of any Air Force School. 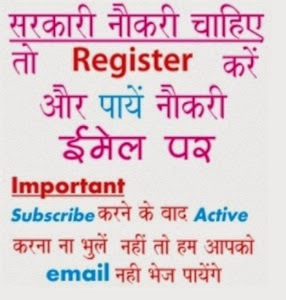 (ii) A Bachelor of Education Degree or its equivalent from a college/ university recognised by Govt of India/AICTE/UGC/National Council of Teachers Education. MA/ MSc in Applied Psychology with Counselling Psychology from a recognised University. (i) A Bachelor’s Degree from any University recognised by the Govt of India/UGC/AICTE, with minimum marks of 50% in the aggregate.